Fernando Alonso has won his second World Championship in 2006 with Renault. Formula One, abbreviated to F1, and also known as Grand Prix racing, is the highest class of auto racing defined by the Fédération Internationale de l'Automobile (FIA), motor sport's world governing body. The "formula" in the name is a set of rules which all participants and cars must meet. The F1 world championship season consists of a series of races, known as Grands Prix, held usually on purpose-built circuits, and in a few cases on closed city streets. The results of each race are combined to determine two annual World Championships, one for drivers and one for constructors. It is a massive television event with millions of people watching each race in more than 200 countries. The cars race at high speeds, often well above 300 km/h (190 mph). The formula introduces a number of restrictions and specifications that cars must meet. These are designed, amongst other things, to keep the ever-increasing cornering speeds in safe ranges. The performance of the cars is highly dependent on electronics, aerodynamics, suspension and tyres. The formula has seen many evolutions and changes through the history of the sport. There have been many different types of engines; normally aspirated, supercharged and turbocharged, ranging from straight-4 to H16, with displacements from 1.5 litres to 4.5 litres. The maximum power achieved in the history of the series was around 1200 bhp in racing trim, during the 1980s turbo era. Europe is Formula One's traditional centre and remains its leading market. However, Grands Prix have been held all over the world, and with new races in Bahrain, China, Malaysia and Turkey since 1999, its scope continues to expand. As the world's most expensive sport, its economic effect is significant, and its financial and political battles are widely observed. Its high profile and popularity makes it an obvious merchandising environment, which leads to very high investments from sponsors, translating into extremely high budgets for the constructor teams. In recent years several teams such as Prost and Arrows have gone bankrupt. The sport is regulated by the Fédération Internationale de l'Automobile (International Automobile Federation more commonly abbreviated as FIA), with its headquarters in Place de la Concorde, Paris. Its current president is Max Mosley. Formula One's commercial rights are vested in the Formula One Group, now owned by Alpha Prema. Although now a minority shareholder, the sport is still generally promoted and controlled by Bernie Ecclestone. Since CVC's purchase the complicated (and according to some sources such as The Economist "murky") business structure has been simplified, leading to suggestions that the Formula One Group could soon be floated. The Formula One series has its roots in the European Grand Prix motor racing (q.v. for pre-1947 history) of the 1920s and 1930s. The " formula" is a set of rules which all participants and cars must meet. Formula 1 was a new formula agreed after World War II in 1946, with the first non-championship races being held that year. A number of Grand Prix racing organisations had laid out rules for a World Championship before the war, but due to the suspension of racing during the conflict, the World Drivers Championship was not formalised until 1947. The first world championship race was held at Silverstone, Britain in 1950. A championship for constructors followed in 1958. National championships existed in South Africa and the UK in the 1960s and 1970s. Non-championship Formula One races were held for many years but due to the rising cost of competition, the last of these occurred in 1983. The sport's title, Formula One, indicates that it is intended to be the most advanced and most competitive of the many racing formulae. Juan Manuel Fangio drove this Alfa Romeo 159 to the title in 1951. 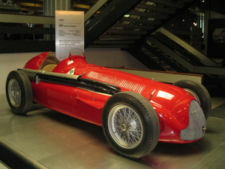 The inaugural Formula One World Championship was won by Italian Giuseppe Farina in his Alfa Romeo in 1950, barely defeating his Argentine teammate Juan Manuel Fangio. However, Fangio won the title in 1951 and four more in the next six years, his streak interrupted by two-time champion Alberto Ascari of Ferrari. Though Britain's Stirling Moss was able to compete regularly, he was never able to win the World Championship. Fangio is remembered for dominating Formula One's first decade and has long been considered the "grand master" of Formula One. The first major technological development, Cooper's re-introduction of mid-engined cars (following Ferdinand Porsche's pioneering and all-conquering Auto Unions of the 1930s), which evolved from the company's successful Formula 3 designs, occurred in the 1950s. Jack Brabham, champion in 1959 and 1960, soon proved the new design's superiority. By 1961, all competitors had switched to mid-engined cars. The first British World Champion was Mike Hawthorn, who drove a Ferrari to the title in 1958. However, when Colin Chapman entered F1 as a chassis designer and later founder of Team Lotus, British racing green came to dominate the field for the next decade. Between Jim Clark, Jackie Stewart, John Surtees, Jack Brabham, Graham Hill, and Denny Hulme, British teams and Commonwealth drivers won twelve world championships between 1962 and 1973. In 1962, Lotus introduced a car with an aluminium sheet monocoque chassis instead of the traditional spaceframe design. This proved to be the greatest technological breakthrough since the introduction of mid-engined cars. In 1968, Lotus painted Imperial Tobacco livery on their cars, thus introducing sponsorship to the sport. Aerodynamic downforce slowly gained importance in car design from the appearance of aerofoils in the late 1960s. In the late 1970s Lotus introduced ground effect aerodynamics that provided enormous downforce and greatly increased cornering speeds (though the concept had previously been used on Jim Hall's Chaparral 2J in 1970). The formation of the Fédération Internationale du Sport Automobile (FISA) in 1979 set off the FISA-FOCA war, during which FISA and its president Jean Marie Balestre clashed repeatedly with the Formula One Constructors Association over television profits and technical regulations. 1981 saw the signing of the first Concorde Agreement, a contract which bound the teams to compete until its expiration and assured them a share of the profits from the sale of television rights, bringing an end to the FISA-FOCA War and contributing to Bernie Ecclestone's eventual complete financial control of the sport, after much negotiation. The FIA imposed a ban on ground effect aerodynamics in 1983. By then, however, turbocharged engines, which Renault had pioneered in 1977, were producing over 700 bhp (520 kW) and were essential to be competitive. In later years, notably 1986, the Formula One turbo cars produced in excess of 1,100 bhp in racing trim (and as much as 1,400 bhp in qualifying trim). These cars were the most powerful open-wheel circuit racing cars ever. To reduce engine power output and thus speeds, the FIA limited fuel tank capacity in 1984 and boost pressures in 1988 before banning turbocharged engines in 1989. In the early 1990s, teams started introducing electronic driver aids such as active suspension, semi-automatic gearboxes and traction control. Some were borrowed from contemporary road cars. Some, like active suspension, were primarily developed for the track and later made their way to the showroom. The FIA, due to complaints that technology was determining the outcome of races more than driver skill, banned many such aids in 1994. However, many observers felt that the ban on driver aids was a ban in name only as the FIA did not have the technology or the methods to eliminate these features from competition. The teams signed a second Concorde Agreement in 1992 and a third in 1997, which is due to expire on the last day of 2007. On the track, the McLaren and Williams teams dominated the 1980s and 1990s. Powered by Porsche, Honda, and Mercedes-Benz McLaren won 16 championships (seven constructor's, nine driver's) in that period, while Williams used engines from Ford, Honda, and Renault to also win 16 titles (nine constructor's, seven driver's). The rivalry between racing legends Ayrton Senna and Alain Prost became F1's central focus in 1988, and continued until Prost retired at the end of 1993. Tragically, Senna died in a crash at the 1994 San Marino Grand Prix having taken over Prost's lead drive at Williams that year. The FIA worked to improve the sport's safety standards since that terrible weekend, during which rookie driver Roland Ratzenberger also lost his life in an accident during Saturday qualifying. No driver has died on the track at the wheel of a Formula One car since, though two track marshalls have lost their life, one at the Italian Grand Prix of 2000, and the other at the Australian Grand Prix of 2001. Since Imola, the FIA has used safety as a reason to impose rule changes which otherwise, under the Concorde Agreement, would have had to be agreed upon by all the teams - most notably the changes introduced for 1998. This so called 'narrow track' era resulted in cars with smaller rear tyres, a narrower track overall and the introduction of 'grooved' tyres to reduce mechanical grip. There would be 4 grooves, on the front and rear, that ran through the entire circumference of the tyre. The objective was to reduce cornering speeds and to produce racing similar to rain conditions by enforcing a smaller contact patch between tyre and track. This was to promote driver skill and provide a better spectacle. Results have been mixed as the lack of mechanical grip has resulted in the more ingenious designers clawing back the deficit with aerodynamic grip - pushing more force onto the tyres through wings, aerodynamic devices etc - which in turn has resulted in less overtaking as these devices tend to make the wake behind the car 'dirty' preventing other cars from following closely, due to their dependence on 'clean' air to make the car stick to the track. The grooved tyres also had the unfortunate side effect of initially being of a harder compound, to be able to hold the groove tread blocks, which resulted in spectacular accidents in times of aerodynamic grip failure e.g. rear wing failures, as the harder compound could not grip the track as well. The more innovative teams have found ways to maximise this dramatic change. McLaren, in a car designed by Adrian Newey, used a 'fiddle' brake on their 1998 car which allowed the driver to apply the brake to one or the other of the rear two wheels to provide them with a better 'toe' into a corner. This was eventually banned as a driver aid. Drivers from McLaren, Williams, Renault (formerly Benetton) and Ferrari, dubbed the "Big Four", have won every World Championship from 1984 to the present day. Due to the technological advances of the 1990s, the cost of competing in Formula One rose dramatically. This increased financial burden, combined with four teams' dominance (largely funded by big car manufacturers such as Mercedes-Benz (DaimlerChrysler)), caused the poorer independent teams to struggle not only to remain competitive, but to stay in business. Financial troubles forced several teams to withdraw. Since 1990, 28 teams have pulled out of Formula One. This has prompted former Jordan owner Eddie Jordan to say that the days of competitive privateers are over. Safety is of paramount concern in contemporary F1. Many records were broken in the first few years of the 21st century by German Michael Schumacher and a resurgent Ferrari. In 2001, Schumacher set the new record for the most Grands Prix ever won (the previous record holder, Alain Prost, had 51 wins). Schumacher eventually retired with 91 Grand Prix victories. Schumacher also holds the record for the most Grand Prix wins in a season - in 2004 he won 13 of the 18 races held that year. In 2003 Schumacher broke the record for most driver's championships by obtaining his sixth, breaking Juan Manuel Fangio's previous record of five which had stood since 1957. In 2004 he won the driver's championship for a seventh time. He also broke the record for most points by scoring his 801st point in Suzuka, Japan. The previous record of 798.5 was also set by Alain Prost. In 2002, Schumacher also set a new record by winning the championship earlier in the season than any previous driver by winning the French Grand Prix in July that year.. Despite Ferrari's dominance, Kimi Räikkönen driving for McLaren-Mercedes had a chance of claiming the championship in 2003 right until the end of the season at the Japanese Grand Prix. Juan Pablo Montoya driving for Williams-BMW also came close. Also in 2003, Fernando Alonso became the youngest ever pole sitter by qualifying first at Malaysia. Later that year he became the youngest ever winner of a Grand Prix when he took the chequered flag in Hungary. Schumacher's championship streak finally came to an end on September 25, 2005 when Alonso clinched the 2005 championship with a third place finish at the Brazilian Grand Prix to become the youngest champion to date, replacing previous record holder Emerson Fittipaldi of Brazil. Michael Schumacher had been world champion for more than 1,800 days. In the rulebook, several driver aids returned due in part to developments that allowed teams to evade the FIA "restrictions". Meanwhile, several changes to the rules were made with the intention of improving the on-track action and cutting ever-increasing costs. Most notably, the qualifying format changed several times between 2003 and 2006. Another new regulation made drivers start each race with the same level of fuel they had during qualifying, introducing a new tactical element to each team's strategy. Other new restrictions included one making it mandatory for each engine to last two races; a driver who had to have his engine replaced would be penalised by starting ten places lower than his actual qualifying position in the starting grid of the race. In 2005, drivers were not allowed to change tyres during the race, unless the tyres were dangerously worn. This rule was removed for the 2006 season. Slick tyres (tyres with no tread) are allowed for the 2007 season after an absence of 10 years. The first few years of the 21st century in F1 also saw some controversies and scandals. At the 2002 Austrian Grand Prix, Rubens Barrichello, Schumacher's teammate at Ferrari who was 1st in the race, was ordered by Ferrari to allow Schumacher to overtake him under "team orders" and win the Grand Prix. Barrichello let him pass on the last lap at the finish line which greatly upset the spectators. At the podium, in response to the jeers of the crowd, Schumacher stood on the second place spot and Barrichello stood on top. Schumacher took the trophy for first place from the chancellor and gave it to Barrichello then took the second place trophy. Barrichello, Schumacher and Ferrari were fined one million U.S. dollars for the failure to observe Article 170 of the Formula One Sporting Regulations concerning the podium ceremony. As a result of this the FIA declared new rules against "team orders" artificially affecting race results. In 2005, the United States Grand Prix at Indianapolis saw only three out of ten teams race in a bizarre mishap when it turned out that the Michelin tyres for the other seven teams could not be safely used on the surface of the track, causing them to withdraw from the race when the FIA refused a change for safety reasons, insisting on keeping to the letter of the regulations. Michelin has since announced that they will stop supplying tyres to F1 teams in 2007, sparking debate on whether this new system would make all F1 racing teams compete on a more equal ground. 2005 marked the end of the V10 era in Formula One. After the banning of turbocharged engines in 1989, V10 became the most popular engine configuration in Formula One. To keep costs down, the configuration was made mandatory in 1998 so that engine builders would not develop and experiment with other configurations. Over this period, the statistics show a supremacy of the Renault and Ferrari engines, with Renault clinching five Constructors and four Drivers championships as engine suppliers and their first ever Drivers and Constructors Championships in a 100% Renault car in 2005. Renault was innovative during this period producing non-standard designs such as the 111° 10-cylinder engine for the 2003 RS23 which was designed to effectively lower the centre of gravity of the engine and thus improve the car's handling. This eventually proved too unreliable and heavy, so Renault returned to a more conventional development route. Ferrari also enjoyed great success in the V10 era, winning six constructors' championships from 1999-2004. In the 2006 season the majority of teams had developed V8 engines as per the newly introduced regulations. However, 2006 also saw the introduction of new teams, and a number of teams being reformed under new management. After purchasing a 45% stake in the BAR team, Honda re-entered F1 as a full team, whereas previously they were only engine suppliers; Sauber was taken over by BMW as Peter Sauber stepped down from top-level management; the long-standing Jordan marque was taken over by Alex Shnaider to become Midland F1 (and late in the 2006 season, purchased by a Dutch consortium headed by the Spyker brand); Red Bull acquired the assets to Minardi and spun off what effectively became a "junior" team to their main Red Bull marque, Scuderia Toro Rosso; finally, Aguri Suzuki, a previous F1 driver himself, acquired the assets to the ex-Arrows team which was reformed into the Super Aguri team. This amount of change was guaranteed to cause some problem, especially as most of the hand-overs occurred late into the 2005 season (especially with the new Super Aguri team). As such, Toro Rosso begun the 2006 season using restricted V10 engines, supplied by Cosworth. The 2007 season will also see great change as engine homologation comes into effect, requiring that engine design and development is frozen at the end of the 2006 season. Once again Renault and Alonso won both titles. At the age of 25 Alonso became the youngest double F1 world Champion. A Formula One Grand Prix event spans an entire weekend, beginning with two free practices on Friday, and one free practice on Saturday. Third drivers are allowed to run on Fridays for teams that finished the preceding season in 5th place or lower. After these practice sessions, a qualifying session is held. The format of this qualifying session has been through several iterations since 2003. Attempts were made to reinvigorate interest in the qualifying session by using a "one-shot" system in which each driver would take turns on an empty track to set their one and only time. For the 2006 season a knockout qualifying system has been introduced. The FIA revised the 2006 procedures starting with Round 11, the 2006 French Grand Prix. In the first phase, all 22 cars are permitted on the track for a 15-minute qualification session. Only their fastest time will count and drivers may complete as many laps as they wish. In the original format, the clocks were stopped immediately at the end of the session, which meant that drivers on a timed lap did not have their time registered once the 15 minutes were up. From Round 11, any car running a timed lap at the time of the chequered flag is entitled to complete the lap. The slowest six cars can take no further part in qualifying, these cars will make up the last six grid positions in the order of their times. The times for the sixteen remaining cars are reset for the next 15-minute session. In the original format, the clocks were stopped immediately at the end of the session. From Round 11, cars running timed laps at the chequered flag are allowed to complete the lap. The slowest six cars will make up the grid in positions 11 to 16 in the order of their times. The times for the ten remaining cars will be reset for the next session. The shootout session lasted 20 minutes under the original regulations, changed to 15 minutes from Round 11. For the final period, the cars will be arranged on the grid in positions one to ten in the order of their times. In the first two 15-minute sessions, cars may run any fuel load and drivers knocked out after those sessions may refuel ahead of the race. However, the top-ten drivers must begin the final 15-minute session with the fuel load on which they plan to start the race. They will be weighed before they leave the pits. Whatever fuel they use in the 15 minutes may be replaced at the end of the session provided that the laps they complete are all within 110% of their best session time; outlaps (a lap that started in the pitlane) and inlaps (a lap that ended in the pitlane) are permitted to be no more than 120% of the driver's best session time. Any fuel for a lap outside of the 110% time will not be replaced. As with the first two 15 minute sessions, if a driver starts a timed lap before the chequered flag falls for the 15 minute session, their time will count even if they cross the finish line after the session has ended. The race begins with a warm-up formation lap, after which the cars assemble on the starting grid in the order they qualified. If a driver stalls before the parade lap, and the rest of the field passes him, then he must start from the back of the grid. As long as he moves off and at least one car is behind him, he can retake his original position. A racer may also elect to start from pit-lane if he has any last minute problems with the car. 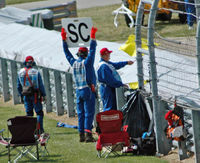 If they choose to do this, they must wait for all cars to pass pit-lane before they may begin the race. A light system above the track then signals the start of the race. Races are a little over 305 kilometres (190 miles) long and are limited to two hours, though in practice they usually last about ninety minutes. Throughout the race, drivers may make one or more pit stops in order to refuel and change tyres. Drivers have access to seven sets of dry-weather tyres, four sets of wet-weather tyres and three sets of extreme-weather tyres for the entire weekend. Drivers must choose the dry-weather compound they will use for the race ahead of qualifying. The FIA awards points to the top eight drivers and their respective teams of a grand prix on a 10-8-6-5-4-3-2-1 basis (the race winner receives ten points, the first runner-up eight, and so on). The winner of the two annual championships are the driver and the team who have accumulated the most points at the end of the season. If any drivers and/or teams have the exact amount of points and are both competing for the driver and/or team championships, the driver and/or team who has won more Grand Prix races during the course of the season is declared the winner. Michael Schumacher and Scuderia Ferrari have each won their respective World Championships a record number of times. Formula One teams must build the chassis in which they compete, and consequently the terms "team" and "constructor" are more or less interchangeable. This requirement distinguishes the sport from series such as IRL, Champ Cars, and NASCAR, which allow teams to purchase chassis, and " spec series" such as GP2, which require all cars be kept to an identical specification. In its early years, Formula One teams sometimes also built their engines, though this became less common with the increased involvement of major car manufacturers such as BMW, Mercedes-Benz, Renault, Toyota, and Honda, whose large budgets rendered privately built engines less competitive (and redundant). Early manufacturer involvement came in the form of a "factory team" (that is, one owned and staffed by a major car company), such as those of Alfa Romeo, Ferrari ( FIAT) or Renault. Companies such as Climax, Repco, Cosworth, Hart, Judd and Supertec, which had no direct team affiliation, often sold engines to teams who could not afford to manufacture them. As the manufacturers' deep pockets and engineering ability took over, almost all engines are now produced by major manufacturers. After having virtually disappeared by the early 1980s, factory teams made a comeback in the 1990s and 2000s, and now form half the grid with Toyota, Ferrari ( FIAT), Honda, Renault and BMW either setting up their own teams or buying out existing ones. Mercedes-Benz (DaimlerChrysler) owns 40% of the McLaren team and manufactures the team's engines. The remaining teams buy engines from the factory teams or from Cosworth, currently the only commercial engine manufacturer. The sport's 1950 debut season saw eighteen teams compete, but due to high costs many dropped out quickly. In fact, such was the scarcity of competitive cars for much of the first decade of Formula One that Formula Two cars were admitted to fill the grids. Ferrari is the only still-active team which competed in 1950, and as of 2006 eleven teams remain on the grid, each fielding two cars. Although teams rarely disclose information about their budgets, it is estimated that they range from US$75 million to US$500 million each. Entering a new team in the Formula One World Championship requires a £25 million (about US$47 million) up-front payment to the FIA, which is then repaid to the team over the course of the season. As a consequence, constructors desiring to enter Formula One often prefer to buy an existing team: B.A.R. 's purchase of Tyrrell and Midland's purchase of Jordan allowed both of these teams to sidestep the large deposit. Each car is assigned a number. The previous season's World Drivers' Champion is designated number 1, with his teammate given number 2. Numbers are then assigned according to each team's position in the previous season's World Constructors' Championship. There have been exceptions to this rule, such as in 1993 and 1994, when the current World Drivers' Champion ( Nigel Mansell and Alain Prost, respectively) was no longer competing in Formula One. In this case the drivers for the team of the previous year's champion are given numbers 0 (Damon Hill, in both occasions) and 2 (Prost himself and Ayrton Senna - replaced after his death by David Coulthard - respectively). The number 13 has not been used since 1974, before which it was occasionally assigned at the discretion of individual race organizers. Before 1996, only the world championship winning driver and his team generally swapped numbers with the previous champion – the remainder held their numbers from prior years, as they had been originally set at the start of the 1974 season. For many years, for example, Ferrari held numbers 27 & 28, regardless of their finishing position in the world championship. As privateer teams quickly folded in the early 1990s, numbers were frequently shuffled around, until the current system was adopted in 1996. Michael Schumacher holds the record for having won the most Drivers' Championships (seven) and Ferrari holds the record for having won the most Constructors' Championships (fourteen). Jochen Rindt became the only posthumous World Champion after a fatal accident at the 1970 Italian Grand Prix. The number of Grands Prix held in a season has varied over the years. Only seven races comprised the inaugural 1950 season; over the years the calendar has almost tripled in size. Though the number of races had stayed at sixteen or seventeen since the 1980s, it reached nineteen in 2005. Six of the original seven races took place in Europe; the only non-European race that counted towards the World Championship in 1950 was the Indianapolis 500, which, due to lack of participation by F1 teams, since it required cars with different specifications from the other races, was later replaced by the United States Grand Prix. The F1 championship gradually expanded to other non-European countries as well. Argentina hosted the first South American grand prix in 1953, and Morocco hosted the first African World Championship race in 1958. Asia (Japan in 1976) and Oceania (Australia in 1985) followed. The current eighteen races are spread over the continents of Europe, Asia, Oceania, North America, and South America. Traditionally, each nation has hosted a single grand prix that carries the name of the country. If a single country hosts multiple grands prix in a year, they receive different names. For example, every year two grands prix take place in Germany, one of which is known as the European Grand Prix. The grands prix, some of which have a history that predates the Formula One World Championship, are not always held on the same circuit every year. The British Grand Prix, for example, though held every year since 1950, alternated between Brands Hatch and Silverstone from 1963 to 1986. The only other race to have been included in every season is the Italian Grand Prix. The World Championship event has taken place exclusively at Monza with just one exception: in 1980, it was held at Imola, now host to the San Marino Grand Prix. One of the newest races on the Grand Prix calendar, held in Bahrain, represents Formula One's first penetration into the Middle East with a high tech purpose-built desert track. The Bahrain Grand Prix, along with other new races in China and Turkey, present new opportunities for the growth and evolution of the Formula One Grand Prix franchise whilst new facilities also raise the bar for other Formula One racing venues around the world. The Autodromo Nazionale Monza, home to the Italian Grand Prix, is one of the oldest circuits still in use in Formula One. A typical circuit usually features a stretch of straight road on which the starting grid is situated. The pit lane, where the drivers stop for fuel during the race, and where the teams work on the cars before the race, is normally located next to the starting grid. The layout of the rest of the circuit varies widely, although in most cases the circuit runs in a clockwise direction. Those few circuits that run anticlockwise (and therefore have predominantly left handed corners) can cause drivers neck problems due to the enormous lateral forces generated by F1 cars pulling their heads in the opposite direction to normal. Many corners have become well known in their own right, such as the high-speed Eau Rouge at Spa-Francorchamps, the Parabolica at Monza and, before the addition of chicanes to tame it, the Tamburello corner at Imola. Others, like thirteenth turn at Indianapolis (road course configuration), are simply straights for the drivers, even having taken in consideration the G-forces acting on the suspension. Also particularly lamented are the circuits at Zandvoort in the Netherlands and Kyalami in South Africa, neither of which are now used by F1. Most of the circuits currently in use are specially constructed for competition. The only real street circuit is the Circuit de Monaco, used for the Monaco Grand Prix, although races in other urban locations come and go ( Las Vegas and Detroit, for example) and proposals for such races are often discussed – most recently for London and Beirut. Several other circuits are also completely or partially laid out on public roads, such as Spa-Francorchamps. The glamour and history of the Monaco race are the primary reasons why the circuit is still in use, since it is thought not to meet the strict safety requirements imposed on other tracks. Three-time World champion Nelson Piquet famously described racing in Monaco as "riding a bicycle around your living room." Circuit design to protect the safety of drivers is becoming increasingly sophisticated, as exemplified by the new Bahrain International Circuit, designed – like most of F1's new circuits – by Hermann Tilke. 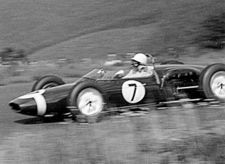 Whereas in the 1950s a driver was lucky to find a strategically placed bale of straw to absorb an impact, modern Formula One circuits feature large run-off areas, gravel traps and tyre barriers to reduce the risk of injury in crashes. This is an ongoing task – after the deaths of Ayrton Senna and Roland Ratzenberger at Imola during the 1994 season, the FIA mandated further changes to circuits. These were mostly aimed at better matching the speed of a car with both the available space to slow down in before reaching a barrier and the ability of those barriers to safely absorb the energy of a crash. Several of the new circuits in F1, especially those designed by Tilke, have been criticized as lacking the "flow" of such classics as Spa-Francorchamps and Imola. 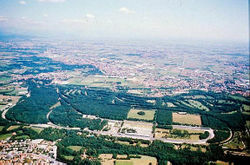 His redesign of the Hockenheim circuit in Germany for example, while providing more capacity for grandstands and eliminating extremely long and dangerous straights, has been frowned upon by many who argue that part of the character of the Hockenheim circuits were the long and blinding straights into the Black Forest. These newer circuits, however are generally agreed upon to meet the safety standards of modern Formula One better than the older ones. Modern Formula One cars are mid-engined open cockpit, open wheel single-seaters. The chassis is made largely of carbon fibre composites, rendering it light but extremely stiff and strong. The whole car, including engine, fluids and driver weighs only 605 kg. In fact this is the minimum weight set by the regulations – the cars are so light that they often have to be ballasted up to this minimum weight. The cornering speed of Formula One cars is largely determined by the aerodynamic downforce that they generate, which pushes the car down onto the track. This is mostly provided by 'wings' mounted at the front and rear of the vehicle, and to a lesser extent by ground effect created by the movement of air under the flat bottom of the car. The aerodynamic design of the cars is very heavily constrained to limit performance and the current generation of cars sport a large number of small winglets and turning vanes designed to closely control the flow of the air over the car. The other major factor controlling the cornering speed of the cars is the design of the tyres. Tyres in Formula One are not 'slicks' (tyres with no tread pattern) as in most other circuit racing series. Each tyre has four large circumferential grooves on its surface designed to further limit the cornering speed of the cars. Suspension is double wishbone or multilink all round with pushrod operated springs and dampers on the chassis. Carbon-Carbon disc brakes are used for reduced weight and increased frictional performance. These provide a very high level of braking performance and are usually the element which provokes the greatest reaction from drivers new to the formula. Engines are mandated as 2.4 litre normally aspirated V8s, with many other constraints on their design and the materials that may be used. The 2006 generation of engines rev close to 20,000 rpm and produce up to 800 bhp. The previous generation of 3-litre V10 engines are also allowed, albeit with their revs limited and with an air restrictor to limit performance. Engines run on unleaded fuel closely resembling publicly available petrol. The oil which lubricates and protects the engine from overheating is very similar in viscosity to that of water. A wide variety of technologies – including active suspension, ground effect aerodynamics and turbochargers – are banned under the current regulations. Despite this the 2006 generation of cars can reach speeds of up to 350 km/h (around 220 mph) at some circuits (Monza). A Honda Formula One car, running with minimum downforce at the Bonneville Salt Flats achieved a top speed of 400 kph in early 2006. Even with the limitations on aerodynamics, at 160 kph, aerodynamically generated downforce is equal to the weight of the car and the often repeated claim that Formula One cars are capable of 'driving on the ceiling' remains true in principle, if not in practice. At full speed downforce of 2.5 times the cars weight can be achieved. The downforce means that the cars can achieve a lateral force of around four and a half times the force of gravity (4.5 g) in cornering - a road car might achieve around 1 g. Consequently in corners the driver's head is pulled sideways with a force equivalent to 25 kilograms. Such high lateral forces are enough to make breathing difficult and the drivers need supreme concentration to maintain their focus for the 1 to 2 hours that it takes to cover 305 kilometres. Formula One went through a difficult period in the early 2000s. Viewing figures dropped, and fans expressed their loss of interest due to the dominance of Michael Schumacher and Ferrari. The FIA has also been tasked with the responsibility of making rules to combat the spiralling costs which affect the smaller teams and to ensure that the sport remains as safe as possible. To this end, the FIA has in recent years instituted a number of rule changes, including new tyre restrictions, multi-race engines, and reductions on downforce. Safety and cost are paramount in all rule-change discussions, and the FIA has made public its intention to continue to modify the rules with these goals in mind. Over the coming years, more radical changes will be made to the rules. In October 2005, the FIA proposal of enhancing overtaking won the support of the teams by agreeing about the new rear wing concept that would eliminate the current single rear wing and replace it with two box-like wings, one behind each rear wheel. These changes are due in 2007. In the long run, the FIA intends to introduce greater restrictions on testing and the introduction of standardised electronic units and tyres. In the interest of making the sport truer to its designation as a World Championship, FOM president Bernie Ecclestone has initiated and organized a number of Grands Prix in new countries and continues to discuss new future races. The sport's rapid expansion into new areas of the globe also leaves some question as to which races will be cut. Viewing figures are seeing some signs of recovery due to the varied 2005 season. Ferrari's dominance ended in 2005 as Renault and McLaren-Mercedes became the top two teams in Formula 1, with Fernando Alonso becoming the new World Champion. There has since been a resurgence of interest in the sport and 22 teams applied for the final 12th team spots available for the 2008 season (eventually awarded to Prodrive). Formula 1 is generally one of the biggest global TV draws behind the Football World Cup and the Olympics. The 2005 Canadian Grand Prix attracted the second largest global TV audience of any sporting event that year with 53 million viewers, behind only the UEFA Champions League final. Formula 1 can be seen around the world on RTL, the longest serving F1 broadcaster, ITV in the United Kingdom (and Canada, via TSN), SPEED Channel (as well as a few races being broadcast on CBS with the GP's in San Marino, European Grand Prix, Spain, and Monaco) in America and many other stations relaying the action live. In Australia, the sport is broadcast by Channel Ten. Recent deals include Al-Jazeera in the Middle East - a market which is steadily growing. During the early 2000s, Bernie Ecclestone's Formula One Administration created a number of trademarks, an official logo, and an official website for the sport in an attempt to give it a corporate identity. Ecclestone experimented with a digital television package (known colloquially as Bernievision), which was launched at the 1996 German Grand Prix in cooperation with German digital television service "DF1", thirty years after the first GP colour TV broadcast, the 1967 German Grand Prix. This service offered the viewer several simultaneous feeds (such as super signal, on-board, top of field, backfield, highlights, pit lane, timing), which were produced with cameras, technical equipment and staff different from those used for the conventional coverage. It was introduced in many countries over the years, but was shut down after the 2002 season for financial reasons. TV stations all take what is known as the 'World Feed', either produced by the FOM (Formula One Management) or the 'host broadcaster'. This is made up of one of the home nations stations such as ITV for the British Grand Prix. The only station that has any difference is 'Premiere' - a German channel that offers All Sessions live and interactive, with features such as the Onboard channel. This service was more widely available around Europe until the end of 2002, when the cost of a whole different feed for the digital interactive services was thought too much. This was a large part because of the failure of the ' F1 Digital +' Channel; launched through Sky Digital in the UK. Prices were too high for viewers to pay when they could watch the Qualifying and Races for Free on ITV1.